Our weather in Seattle tends to be sort of unpredictable to say the least, especially this time of year. So for this week’s WDIWW, we thought we would focus on different ways to wear plaid. Part punk rock, part grunge, part country it’s an easy, casual trend to wear that can be easily adapted into a summer wardrobe. The key to making it casually cool is to pair them with warm neutral shoes and accessories. On not so sunny days pair them with jeans and and booties or some buttery soft oxfords. For the warm weather days wear a pretty plaid dress with a pair of tan low heel sandals. So tap into the Pacific Northwest vibe and try wearing some plaid this summer. > Coclico “Tickler” sandal in cuoio leather, made in Spain. > Aunt’s and Uncle’s “Goody” bag in honey leather, please contact for price and availability. 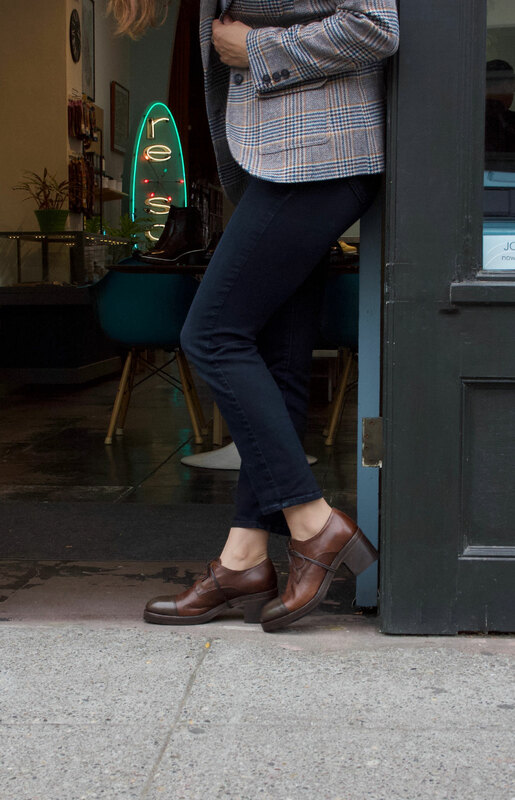 > Kudeta almond shape toe oxford in fango/taupe leather, made in Italy. > Kudeta double gore bootie in cuoio leather, made in Italy.